The Volkswagen Type 2 (T3) was the third generation of the Volkswagen Transporter and was marketed under various nameplates worldwide – including as the Transporter or Caravelle in Europe, Microbus in South Africa and as the Vanagon in North and South America. Larger and heavier than its predecessor, the T2 – and with a more squared and less rounded styling – the T3 was manufactured in Germany from 1979 until 1992. 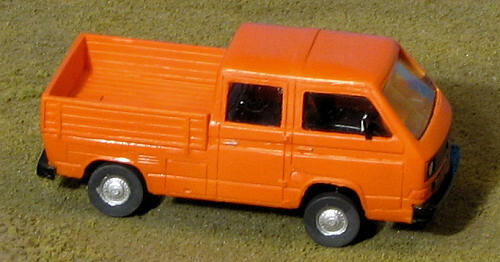 South African production of the T2 continued, for that market only, until 2002. The T3 was the last of the rear-engined Volkswagens. Like many other utility type vehicles, the T3 was utilized a great deal by NATO forces for general transportation, such as carrying pilots and crews to their aircraft, which were often situated a goodly distance away from the operations buildings. Maintenance types also liked it as it could carry friends and had a nice drop side bed for carrying oversize bits and pieces. OK, I'm assuming the sides dropped down as they did on the older versions. The PJ Production kit is very nicely molded in a tan resin. 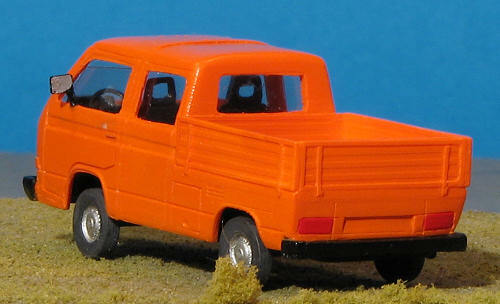 This one is the pick up version, but aside from the body, the rest of the kit is identical to the van variant. 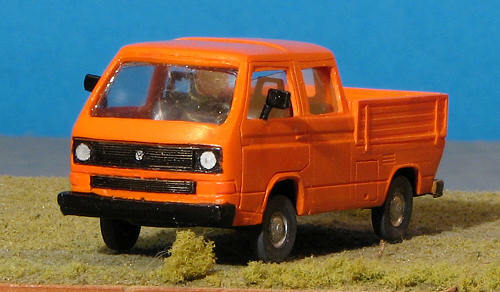 There are fifteen very nicely molded resin bits that include a one piece body, one piece chassis, four wheels, a rear bench seat and front driver/passenger seat. There are also two axle assemblies, a dash board, two side view mirrors and a steering wheel. Assembly seems to be very simple and the kit provides an exploded diagram to assist on locating just where parts are to be placed. Detail painting information is given as well. Thanks to the flat windows, the large sheet of clear plastic should be more than enough to handle the transparency situation. No overall painting information is supplied as really, none is needed for there are ample examples of this vehicle on the web. Simply use your favorite search engine and you will find a plethora of options. The first step in doing a model like this is to clean up the various parts. That includes removing the light flash from the window openings and the resin pour stub bits from the body exterior. In this case, these are the little 'spikes' around the bottom of the body that you can see in the image. These can be removed with sandpaper or a sharp scalpel. Once that is done, some of the other pieces are cleaned up in preparation for assembly or painting. The next step was to start gluing on a few bits. I cemented the front seats in place, making sure to test fit the chassis o nce done to be sure of proper fitting. 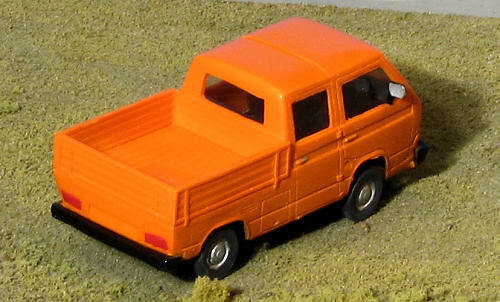 For the rear seat, the instructions suggested that I glue the flat piece on the back just below the rear window opening. This would do two things. One is that it would make the seat rather high in the back and the other is that it would block the rear window enough to make installing the acetate a bit difficult. So what I did was two-fold. First of all, I removed about half of the resin slab on the back so that I could fit the seat on the floor and still have it fit far enough back so it wouldn't look odd. 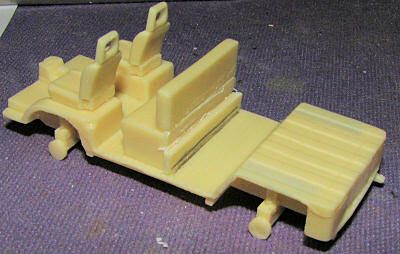 Then, I set the rear seat on the interior floor and put the body on it. Once I moved the seat in position, I held it down tightly and marked on the floor with a pencil, its location. Next, the seat was tacked in place and the clearances checked. Once that was verified it was cemented in place. As mentioned earlier, the only difference between this and the van is the body, so there are no markings on the floor for properly fitting the rear seat. I also attached the suspension pieces. Moving to the dash, I tried gluing that to the small post in the front, but when I mated the body, it just didn't fit well. There is a small ledge on the front of the body and I ended up gluing the dash to that ledge after a bit of trimming to get the best fit. At this time, I decided to do some painting. Body first so I went with a nice darkish orange color that I had in the paint stash. This is a Model Car World Lacquer and it went on to the bare resin without any problems. I should add that I did wash the body with warm water and dish soap prior to the painting. For the chassis, well that was painted with Tamiya X-18 semi gloss black as I had some already mixed. This was used for the body bumpers and the grilles in the front as well. Both the inside and outside of the chassis were painted with this black. I used Floquil weathered black for the dash and seats. 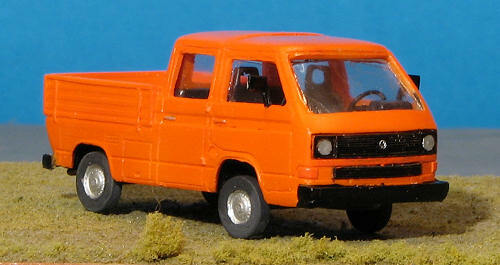 The turn signals were painted Humbrol orange and red. Imagine my disgust when I discovered that the 'custom mixed' MCW paint was exactly the same shade as the much less expensive Humbrol orange. As an aside, I'd recommend not dealing with this company as every shade I've bought from them as being specially mixed is exactly the same shade as some easy to find paint from some other company. Anyway with most the bits painted, it was back to some construction. For this, it was wheels, 'glass', steering wheel, and side mirrors. The wheels were painted weathered black with Humbrol #11 silver hubs. These were then glued on. I painted the steering wheel black and started cutting acetate for the windows. This wasn't as easy as I thought it would be, but after some work, I had them all installed, using gloss clear paint for cement. The side mirrors were painted and one of them just disappeared at this time. Searching turned up nothing so I made a replacement out of plastic card. Naturally, after the replacement was made, I found the original in a place I KNEW I'd searched several times before. Both of these items were cemented in place with clear gloss paint, though I did use superglue for the steering wheel. The last step was to attach the chassis to the body. For some reason, the chassis rides nose high. I tried sanding everything I could think of that might be causing this, but to no avail, so it is nose high. As is frequently the case with me, something that looks like three day's work takes two weeks and so it was with this one. The end result is something a bit different from the norm and I'm sure it would look a tad odd on a NATO air field. I like that PJ Production provides a template for making a canvas top for the pick-up bed and would like to see them do a template for the clear bits as well for it would surely help. It would also be nice if they provided some paper license plates for us to use as the vehicle looks a bit naked without them. Regardless, it is a neat build and is something you should consider. These have been selling very well so you might want to check for availability soon.